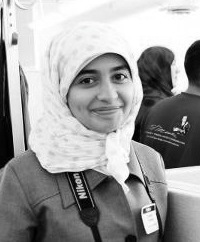 Zainab is a senior English language and literature student at the University of Bahrain. She has been writing since the age of nine and it has always been the thing that defines her personality. At one point she says she stopped writing because she thought it was “easier to abandon the dream of becoming a writer when the dream is small. I knew that I was wrong and returned ever more passionate”. Zainab mainly writes poems but she has never published any of them. The Askance Publishing competition was the first time she had sent her work anywhere. Her short story “24 hours” is featured in the 2014 anthology Homes. She is planning to do her Masters degree in Creative Writing next year in the UK, but doesn’t want to be just a writer; but a journalist, a novelist and maybe a photographer as well. Zainab has a huge interest in politics and social improvements. She has been selected for two programs in the United States: one about journalism at Murrow College, and the other was on women’s rights at Wheelock College. She says, “this is the beginning of my life and I hope my words can bring change to the world”.